Definition at line 30 of file CQPlotDM.h. Definition at line 22 of file CQPlotDM.cpp. Definition at line 32 of file CQPlotDM.cpp. Definition at line 50 of file CQPlotDM.cpp. References COL_ACTIVE_PLOTS, COL_CURVES_PLOTS, COL_NAME_PLOTS, COL_ROW_NUMBER, flags(), FROM_UTF8, CCopasiRootContainer::getDatamodelList(), CPlotSpecification::getItems(), CCopasiObject::getObjectName(), CPlotSpecification::isActive(), CQBaseDataModel::isDefaultRow(), rowCount(), and CCopasiVector< T >::size(). Definition at line 37 of file CQPlotDM.cpp. Definition at line 112 of file CQPlotDM.cpp. References COL_ACTIVE_PLOTS, COL_CURVES_PLOTS, COL_NAME_PLOTS, and COL_ROW_NUMBER. Definition at line 206 of file CQPlotDM.cpp. References ListViews::ADD, COL_NAME_PLOTS, CQBaseDataModel::createNewName(), CCopasiRootContainer::getDatamodelList(), CQBaseDataModel::notifyGUI(), ListViews::PLOT, CPlotItem::plot2d, and TO_UTF8. Definition at line 242 of file CQPlotDM.cpp. 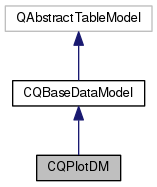 References CCopasiRootContainer::getDatamodelList(), CCopasiDataModel::getModel(), CCopasiDataModel::getPlotDefinitionList(), CQBaseDataModel::isDefaultRow(), and CQBaseDataModel::removeRow(). Definition at line 221 of file CQPlotDM.cpp. References ListViews::DELETE, CCopasiRootContainer::getDatamodelList(), CQBaseDataModel::notifyGUI(), and ListViews::PLOT. Definition at line 28 of file CQPlotDM.cpp. Referenced by data(), and CQPlotsWidget::deleteSelectedPlots(). Definition at line 138 of file CQPlotDM.cpp. References ListViews::CHANGE, COL_ACTIVE_PLOTS, COL_NAME_PLOTS, CQBaseDataModel::createNewName(), data(), CCopasiRootContainer::getDatamodelList(), CCopasiObject::getObjectName(), CQBaseDataModel::insertRow(), CPlotSpecification::isActive(), CQBaseDataModel::isDefaultRow(), CQBaseDataModel::notifyGUI(), ListViews::PLOT, CPlotSpecification::setActive(), CCopasiObject::setObjectName(), and TO_UTF8.